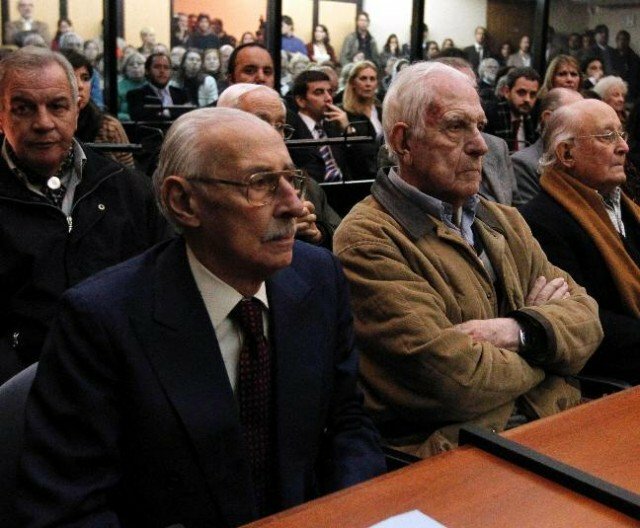 Former leaders during Argentina’s military rule Jorge Videla and Reynaldo Bignone have been found guilty of overseeing the systematic theft of babies from political prisoners. A court in Buenos Aires sentenced Jorge Videla to 50 years in prison and Reynaldo Bignone to 15 years. They are already serving lengthy jail sentences for crimes committed under military rule, between 1976 and 1983. At least 400 babies are thought to have been taken from their parents while they were held in detention centres. The verdict is the culmination of a trial that began in February 2011. In total, 11 people, most of them former military and police officials, were facing charges. Nine, including Jorge Videla and Reynaldo Bignone, were convicted in the case over the theft of 34 babies. Two were found not guilty. Jorge Videla, 86, received the maximum sentence as he was held criminally responsible for 20 of the thefts. The court said Jorge Videla was guilty of the “systematic abduction, detention and hiding of minors under the age of 10”. Jorge Videla listened to the verdict without showing any visible emotion. Both he and Reynaldo Bignone were already serving time in prison. Jorge Videla was sentenced to life imprisonment in 2010 for the torture and deaths of 31 dissidents during his rule. Reynaldo Bignone was also given a life sentence in April 2011 for the torture and murder of political opponents. Victims’ groups nevertheless welcomed the latest verdicts as a confirmation of the defendants’ guilt for what many consider as the most heinous crimes committed under military rule. Relatives of the stolen babies, and those who were abducted themselves, cheered as the verdicts were read out. One of the victims, Macarena Gelman, said the conviction was “historic”. “To see the faces of those responsible is a sign that justice is making progress,” she told Efe news agency. Macarena Gelman was raised by a police officer in Uruguay after her Argentine parents were abducted by the military in 1976. Her mother was taken to a clandestine prison in Uruguay and disappeared. Her father’s body was later found in a cement-filled drum dumped in a river. Macarena Gelman has since been re-united with her grandfather, Argentine poet Juan Gelman. More than 100 children given for adoption to military or police couples have been reunited with their biological families. The Grandmothers of the Plaza de Mayo, an association that works to uncover the real identities of the stolen children, believes several hundred babies were abducted. However, some of the children have said they would rather not know their origins, especially if the information implicates their adoptive parents in illegal acts. Human rights groups say that during military rule, known as the “Dirty War”, some 30,000 people were killed or made to disappear by the armed forces in their campaign against opposition activists and left-wing guerrillas.